There are many derivations of cayenne pepper powder in the marketplace. Some wonder what is the best one to choose. This is understandable. In this short web page within this CayennePepper.info site, I can give you some criteria to utilize when selecting the best cayenne powder. I won't go into it in depth now, but as you may or may not know, there are different "versions" or classifications or cayenne pepper. There are also variants to the cayenne pepper powder in heat, color and nutritional potency. It's important to know these. Cayenne is hot. Its heat is generally ranked by two methods, the Gillette Method and the Scoville Heat Units (SHU). The Scoville heat classification is the most popular, measuring the capsaicin in the cayenne. Cayenne is generally rated at a minimum of 30,000 to 50,000 SHUs but can also be rated as hot as 90,000 to 140,000 SHUs. 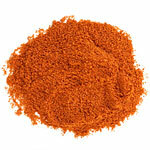 The 30,000 to 50,000 SHU cayenne pepper powder is very commonly found; the hotter cayenne less so. Trust me when I say the 30 - 50k SHUs cayenne is plenty hot and has wonderful nutritional and therapeutic health benefits. Most people tend to think that more is better, which is understandable. Taking 90k to 140k SHU cayenne is a challenge. It's very hot. One must balance discretion with desired benefits, in my view. As taking cayenne is so challenging for many, it is advisable to start small. Taking 30 to 50k SHU cayenne is more than sufficient. That's not to say you shouldn't take the hotter cayenne pepper powder eventually. If you do, just take much less. For beginners, take the 30 to 50k SHU cayenne pepper powder. That's my recommendation. The 70 to 140k SHU cayenne is simply too much for most people. Drinking Cayenne Pepper Powder Water?!?! A quick anecdote to illustrate the point. An acquaintance was telling me about his hemorrhoid problem and I told him unabashedly, "Take cayenne pepper in water and drink it daily. That should help. It helped my hemorrhoid problem. I'm not a doctor and you should see your doctor, but it worked for me and has worked for many others." He was open minded enough to try it. He didn't believe me when I told him I drink it regularly, though. "You really drink it?" He asked me incredulously. So, I did. I drank an eight-ounce glass of half a teaspoon of 90k SHU African birdseye cayenne right in front of him. He was stunned. He had some of his own cayenne as someone had told him he should take it as it's so good for you, which was great to hear. I tasted a small amount and I'd rate it as a 30 to 50k SHU cayenne. As I knew what was coming, I entertained the thought of selling him on using my African birdseye cayenne pepper powder but he insisted on using his own. "Smart boy," I thought with a wry smile. He put an eighth of a teaspoon in warm water with some honey (his idea) and drank it. It was almost comical watching him cope with the "after effects." Coughing, mucous galore, spitting, watery eyes, flushed red face -- the works! He thought it was going to be easy as he watched me drink mine straight without so much as a cough. He didn't know I'm used to it now and that my body has adapted. He had never in his life used cayenne so I wasn't too surprised by his body's virulent reaction to it. He's going to stick with it, he said. I hope he does. So, the point of the story? Here it is: 30k to 50k SHU cayenne pepper powder is more than sufficient for most people. If it's too hard to tolerate, people won't stick with it. Start small and build up to it. Your body will adapt. All cayenne is good for you but there is one thing to look for (other than freshness, of course) that I recommend. This recommendation is something I've heard from those herbalists and others for years. Look for the beautiful orange-red cayenne. Why? The bright orangish-colored cayenne powder is indicative of a high degree of beta carotene or vitamin A. That's not to say that darker colored cayenne is bad for you. It isn't -- not at all. It's simply not as flushed with beta carotene or Vitamin A as the bright orange cayenne. Notice how one is a beautiful orangish-red color with the coloring about 80% to 90% orange-colored and the other one with a beautiful burgundy color. Both are wonderfully healthy for you. In my refrigerator right now, I have both. One is 90k SHU and the other 50k SHU, the orange and burgundy ones respectively. I like the orange-colored cayenne as it is teeming with a high degree of beta carotene or Vitamin A. The other still has beta carotene but not as much. Common grocery store cayenne powder tends to be brownish red. Good health food store, or herbal wholesaler cayenne powder, tends to have vibrant reddish burgundy and orangish red like you see above. Continuing, notice the spectrum of colors that cayenne pepper powder can come in. It has a beautiful range from dark, rich burgundy to a light yellowish-brownish color. All these cayenne powders are great for you. These cayenne pepper powders range from the 35,000 SHU to 160,000 SHUs so while there's a range of colors, there's also a range in heat and the consequent capsaicin as well. The color is not an indicator, though, of capsaicin. I hope now you know what cayenne pepper powder you should buy. You can find cayenne in any grocery store (I don't recommend grocery store cayenne though as it's most likely irradiated). I recommend buying it at a local health food store or at an online herb shop with rigid quality-control protocols in place. Cayenne pepper type classification, i.e., Capsicum minimum, Capsicum annuum, or Capsicum fastigiatum. The Capsicum minimum is very common. The African birdseye cayenne is much more difficult to find although it certainly is available online. SHU units. A minimum of 30 to 50k SHU cayenne powder. This SHU rating should be adhered to for cayenne beginners. Bright orangish-reddish colored cayenne. This orangish color is indicative of a high degree of beta carotene or vitamin A (see the graphic above). In my opinion, this is ideal. That said, the burgundy-reddish-colored cayenne is still very nutritious, potent and healthy. Price. I've seen it as low as $1.67 a pound and as much as $26 a pound online. The kind I saw that was $26 was high-quality, 90k SHU African birdseye cayenne and had a bright, beautiful orangish-red color and was certified as organic, which is highly desirable. Lastly, if you're interested in supplementing or experimenting with cayenne, you can get more information about buying good quality cayenne at this article here within this site. Or, if you'd like to see a more comprehensive price list on many different cayenne pepper product options, go here.